OK, obviously pizza isn’t exactly French, but this pie’s fresh flavors, creamy brie and tangy balsamic reduction make me think of that famous French countryside. Cooking the ingredients separately before adding them to the pizza allows for a unique layering of flavors, a technique made famous by the American queen of French cooking, Julia Child. Serve it in thin wedges with glasses of chilled Champagne or with a crisp green salad for a light supper. 3 oz. creamy brie $4 for 8 oz. Preheat oven to 425 degrees F. Lightly flour a baking sheet or pizza pan. Set aside. Heat 1 tbsp olive oil in a medium frying pan over medium heat. Add sliced onions and cook slowly, allowing to caramelize. This should take 8-10 minutes. Stir occasionally. 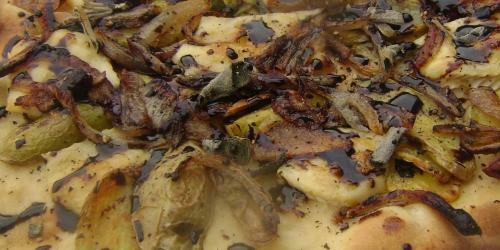 While onions caramelize, heat another tbsp of olive oil in a medium frying pan over medium-high heat. Add potato slices and cook for 3-4 minutes on each side, or until golden brown. Pour balsamic vinegar into a small pot and cook over medium heat for 12-15 minutes, stirring frequently, allowing to reduce into a thick syrup. Remove from heat. To assemble pizza, roll dough out onto a floured surface into a 12" circle. Transfer to floured pan. Brush dough with remaining tbsp olive oil. Arrange onions, brie, potatoes, sage, salt and pepper evenly over dough and bake for 15-18 minutes or until cheese melts and crust is golden brown. Dip a spoon in the balsamic reduction and carefully drizzle reduction over the pizza. You may not need all of the reduced vinegar. This sounds like my dream pizza, I am going to make it this weekend! Yum! Wow, does this look amazing. I’ve avoided the pizza and potatoes combo so far, but I will make this. Recipe of Pizza Provencal mentioned in this page. The estimated value to make this dish at home is almost $8 which is very reasonable and everyone can afford it and make the whole time very enjoyable. I have great craze of recipes and always looking the best and new recipes.